In 2010, for the first time ever Pepsi repositioned the brand from a Super Bowl advertising icon to a catalyst for ideas to refresh the world. The Pepsi Refresh Project was a game-changing pro-social endeavor for Pepsi to position themselves in the minds of consumers as a positive, optimistic force for change in communities, revolving around issues and ideas that people personally cared about. The Pepsi Refresh Project was designed to give millions of dollars in grants in the U.S. to fund good ideas, big and small, that move communities forward. HUGE laid out a plan for a fully integrated digital initiative that built on an idea initially conceived by TBWAChiatDay and the Refresh Everything program that Pepsi launched in 2009. HUGE completed strategy, design and development for refresheverything.com, the community-focused platform, which allows anyone, anywhere to submit and vote for an idea, big or small, for the chance to receive a monthly-distributed grant. The Pepsi Refresh Project features significant social engagement around people and the power of ideas, with the intention to foster innovation in social good. HUGE and Pepsi recognized that a new movement was taking hold of the country, not based on geography, ethnicity, or other segregations, but rather, born from a collective optimism. Studies with the Pepsi Optimism Project found that 94% of Americans agree that optimism is essential in building new ideas to positively impact the world, and a full 66% believe that the best ideas are more likely to come from normal people as opposed to public figures. To fully cultivate and celebrate this collective optimism, Pepsi needed to capture this new momentum, and not simply broadcast a message. The platform had to encourage users to engage with Pepsi and needed to be trustworthy and seamless for the user. A standalone website that people visit once and forget later wouldn’t be enough to fulfill Pepsi’s benchmarks for customer loyalty, acquisition and engagement. The primary persona was someone active in social media and in their community. 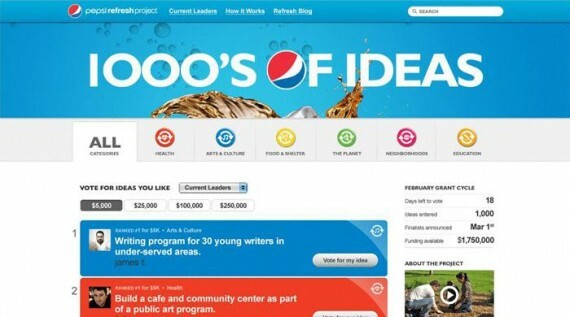 As a result HUGE developed refresheverything.com and an overarching social media solution for Pepsi. The platform focused on developing functionality that would actually advance the Refresh Project’s mission, deliver value to users to help them accomplish their goals, and use social media in a more meaningful way. In 2010, the Pepsi Refresh Project directed more than $20 million to fund more than 1,000 great ideas from people across the United States. Among the Pepsi Refresh Projects that secured grants are 108 schools, 68 parks and playgrounds, and 20 children’s homes, shelters and affordable houses. More than 87 million votes have been cast on www.RefreshEverything.com, with more than 6.5 million voters registered on the site. In 2011, the Pepsi Refresh Project is again giving away more than a million dollars each month on RefreshEverything.com to fund even more fun ideas that move communities forward. Pepsi will continue to give out more than a million dollars in grants each month, up to 64 grants in total, which is double the number of grants awarded in 2010. The Pepsi Refresh Project significantly improved Pepsi’s brand attributes including favorability, intent and trust along with intent to purchase among millennials through interaction with RefreshEverything.com. Awareness of the Pepsi Refresh Project is two times more compared to similar cause-marketing programs. A study in 2010 from Forbes and the Reputation Institute found that Pepsi jumped to the No. 5 spot from No. 16 among the country’s most reputable brands, thanks to Pepsi Refresh. The Pepsi Refresh Project was about understanding people, and making it fun and easy to help them help each other and their community, while building buzz for Pepsi and ultimately making the world a better place. HUGE conducted extensive user research to recognize this social movement and shift in optimism. The team started prototyping early on in the project and developed two templates critical to user experience – the homepage and the idea page. HUGE completed 3-4 full iterations of the platform before launch, keeping user experience at the center of the project. The refresheverything.com platform allows visitors to vote for their favorite ideas and submit and promote their own ideas, on their own terms. Users can also get inspired by joining a discussion about a particular topic or by reading/sharing articles and videos about others. We couldn’t simply depend on users visiting refresheerything.com so we developed an action-oriented Facebook application to share and vote for ideas as well as iPhone and Android applications that leverage the voting functionality and community aspects of the main site. The campaign has been supported with online banners, integrated media campaigns, TV, print, outdoor, college programs and retail display.